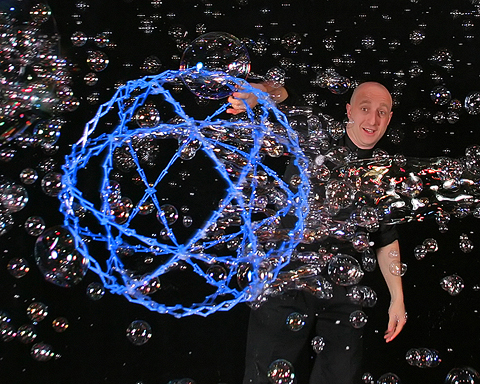 New York, NY - It was a soapy spectacular as pre-eminent bubble artist Casey Carle brought his act to the Lortel Theatre on Saturday, April 21, 2007 - he's bubble consultant to Cirque du Soleil and the audience got to see why! Loaded with visual comedy, quick wit and big band music, not to mention big beautiful bubbles, Casey Carle's BubbleMania was an interactive treat for the whole family! The Lucille Lortel Theatre has been in continuous operation as New York's premiere Off-Broadway Playhouse since 1955. It has housed productions such as Arthur Kopit's Y2K (Manhattan Theatre Company), Shakespeare's Cymbeline (Theatre for a New Audience) and Romeo and Juliet (TheaterworksUSA), Lee Blessing's Cobb (The Melting Pot Theatre Company & Trigger Street Productions), and Noel Coward's Suite in Two Keys (Mirage Theatre Company). The Theatre has also been host to numerous benefit performances, readings, and meetings such as: a benefit for the AIDS Theatre Project; an informational meeting regarding 9/11 emergency relief by the New York Foundation for the Arts; and a benefit performance of Watch Your Step, a landmines awareness program sponsored by the Vietnam Veterans of America Foundation. To catch Casey's act near you take a look at his constantly updated public appearance schedule at http://www.BubbleMania.com/appearances.